He will host “Piecing Our Stories: A Student Conversation with Rev. Jesse Jackson” at 12:30 p.m. in Sandberg Auditorium, which is co-sponsored by the Pick Museum and the Office of Academic Diversity, Equity and Inclusion. This presentation is free and open to the public. Seating is limited. Parking for off-campus patrons will be in the Holmes Student Center Visitor Lot. Visitors may be referred to additional parking in lots K & L, which are just south of Barsema Alumni and Visitors Center. 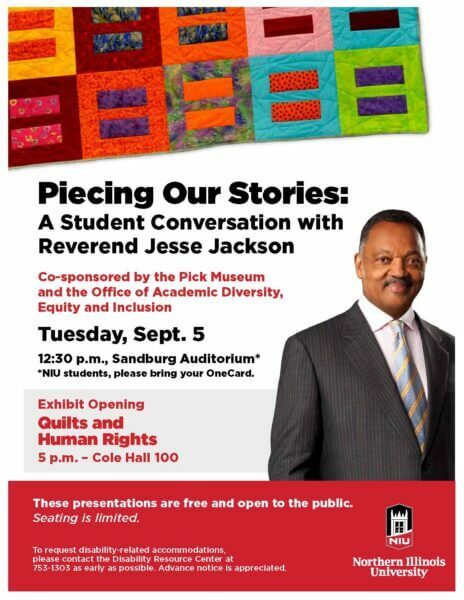 Later that day, he will offer brief comments at 6 p.m. in conjunction with the “Quilts and Human Rights” exhibit opening in Cole Hall 100. Originally curated at the Michigan State University Museum, “Quilts and Human Rights” features quilts from around the world that honor champions of human rights and document quiltmaking as a means of coping with oppression, and it examines how quilts raise awareness of global social issues. Twenty-eight quilts in the exhibit come from the Michigan State University Museum’s traveling exhibit, and Pick Museum staff has expanded the exhibit by adding 15 additional quilts made between 2008 and today to highlight the last decade’s booming modern quilting movement and to bring the exhibit’s topics and themes up to the present day. The opening reception, scheduled from 5-8 p.m., will also feature a workshop led by the Social Justice Sewing Academy. Sara Trail, the group’s founder, will teach visitors how to make a social justice themed quilt block. All of the blocks made at the opening will be sewn together and become a quilt about NIU’s current activist and political climate. The event is free and open to the public. Seating is limited. The Pick Museum serves as a teaching museum for the university, providing opportunities for students and faculty to conduct collections research, co-curate exhibitions and enrich curriculum through object-based learning. Special exhibitions promote cultural awareness and solidarity in support of global social justice. Programs and events invite campus and community audiences to explore human and cultural diversity with the museum. Rev. Jackson, president and founder of the Rainbow PUSH Coalition, is one of the world’s foremost human rights, religious and political figures. For more than 50 years, the two-time presidential candidate, former CNN talk show host and newspaper columnist has played a pivotal role in civil rights, gender equality, and social justice. In 2000 President Bill Clinton awarded him the Presidential Medal of Freedom, the highest civilian honor. Today, Rev. Jackson is at the forefront of the struggle for diversity and equality as he crosses the globe in the name of nonviolence and justice, tearing down walls and building bridges. An assistant to Dr. Martin Luther King Jr., Rev. Jackson directed Operation Breadbasket and subsequently founded People United to Save Humanity (PUSH) in Chicago in 1971 to expand educational and employment opportunities for the disadvantaged and communities of color. He then founded the National Rainbow Coalition in 1984, a national social justice organization devoted to political empowerment, education, and changing public policy. The Rainbow Coalition and Operation PUSH merged into the Rainbow/PUSH Coalition in September 1996 to continue both philosophies and maximize their resources. A hallmark of his work has been his commitment to youth—inspiring hope and challenging young people to achieve academic excellence and to stay drug-free—and the American labor movement—working with unions to organize workers and mediate labor disputes. A renowned orator, Reverend Jackson has received numerous honors for his work in human and civil rights and for non-violent social change. As a highly respected world leader, Rev. Jackson has acted many times as an international diplomat in sensitive situations. He secured the release of captured Navy Lieutenant Robert Goodman from Syria, as well as the release of 48 Cuban and Cuban-American prisoners in 1984. He was the first American to bring hostages out of Kuwait and Iraq in 1990 and in 1999 he negotiated and secured the release of US soldiers held hostage in Kosovo. “Quilts and Human Rights” is made possible through the generous sponsorship of Cordogan Clark and Associates Inc., and individual quilt sponsors. All exhibit programming is co-sponsored by NIU’s Center for the Study of Women, Gender and Sexuality. For more information, please contact NIU’s Pick Museum of Anthropology at 815-753-2520 or lmcdowellhopper@niu.edu .